The Georgian frontage and modern interior of The Three Swans in Hungerford disguise the fact that it has been an inn since at least the early 1600s, and probably much earlier. The building is thought to date from the late 1500s, when its predecessor, possibly also an inn, was lost in a fire that destroyed a large part of the town. It was in the late 1700s that The Three Swans got its Georgian makeover, covering the timber-frame construction with a brick and plaster façade, and installing modern sash windows. The inn’s location close to the mid-point of the Oxford to Salisbury road, was attested by the erection of a painted milestone, which is still attached to the front of the building today. In this period The Three Swans became an increasingly popular resting and refuelling place for generally wealthy travellers. It had stabling for more than 40 horses, and storage for 20 tons of hay. An inventory showed that at one time the stock of wine and brandy, at 156 gallons, was almost as much as the beer stock. During the early 1800s The Three Swans was acquired by a local businessman who established it as his flagship inn within a large portfolio of licensed premises in the area, all served by a new commercial brewery that he built in the town, just the other side of the present railway bridge in the High Street. 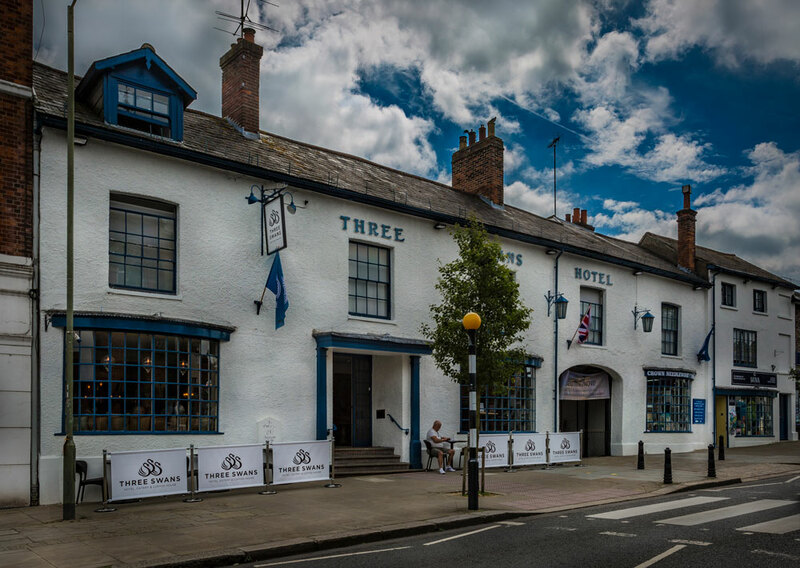 It was the coming of the railway, in 1847, that transformed The Three Swans from an old coaching inn into a ‘railway hotel’, and a destination for gentlemen from London visiting the town for country sports.